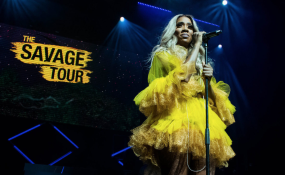 Held at the expansive Bilbao Exhibition Center, Bilbao, Spain, amidst glitz and glamour, Tiwa beat other nominees, including David Adeleke, aka Davido; South Africa's Destruction Boyz and Shekinah; Kenya's Nyashinski and Fally Ipupa from the DRC to win the award. "I'm just a girl from Nigeria living my dreams. I'm so thankful to everyone that's supported my journey so far, especially my fans. Thank you MTV!" However, this is not Tiwa's first time on MTV's stage, as the Kelekele Love singer had won the Best Female Act at the African version of the reward scheme, the MTV Africa Music Award (MAMA) in 2014. Executive Vice President and Managing Director for Viacom International Media Networks Africa and BET International, Alex Okosi, said, "The MTV EMAs are always a proud moment for the continent. The Africa Act category is indicative of our commitment to elevate and showcase Africa's collective talent and potential on a global scale. We are so proud of Tiwa. This year's show also awarded the first-ever MTV EMA Generation Change Award" to elevate and empower the fearless, original young people who are changing the world. MTV awarded five change makers from around the globe, all under the age of 26, during the red carpet pre-show. The winners are among a generation of young people who are tackling the world's toughest problems - including fighting for environmental protection, refugee rights, ending child marriage, mental health support and LGBTQ+ equality -- through music, storytelling and digital media. Nigeria's 26-year-old Hauwa Ojeifo - a bold change maker, who founded a movement of love, hope and support to give mental health a voice in her home country, Nigeria - was announced a joint winner of the first-ever MTV EMA Generation Change Award. She jointly won together with four nominees including Xiuhtezcatl "X" Martinez (USA), Ellen Jones (UK), Mohamad Aljounde (Lebanon) and Sonita Alizadeh (Afghanistan). "We are equally honored to announce Hauwa Ojeifo as joint MTV EMA Generation Change Award winner, she is testament to the powerful contribution of our youth for impactful change," concluded Okosi. Other highlights include Hailee Steinfeld officially kicking off the show with an EMA award art heist, followed by Panic! At The Disco's Brendon Urie scaling Bilbao Exhibition Centre's exterior before crashing through the ceiling to perform "High Hopes." Modern Flamenco-inspired sensation and Spain native Rosalía, one of the most buzzed-about acts of the night, rolled on stage in a gigantic truck before rocking the entire house with "Malamente" alongside 24 dancers. Throughout the night, Steinfeld commanded the stage with her captivating hosting skills, and for her performance, she gave a nod to her upcoming film Bumblebee by performing soundtrack number "Back to Life" from inside a yellow human vehicle, artistically created with more than 20 bodies. Jason Derulo sang an operatic rendition of Andrea Bocelli's "Time to Say Goodbye" before flowing into his collaboration track "Goodbye" with David Guetta and Nicki Minaj, both of whom joined him on stage. Alessia Cara gave a colorful performance for "Trust Me Lonely" against a backdrop of different settings.